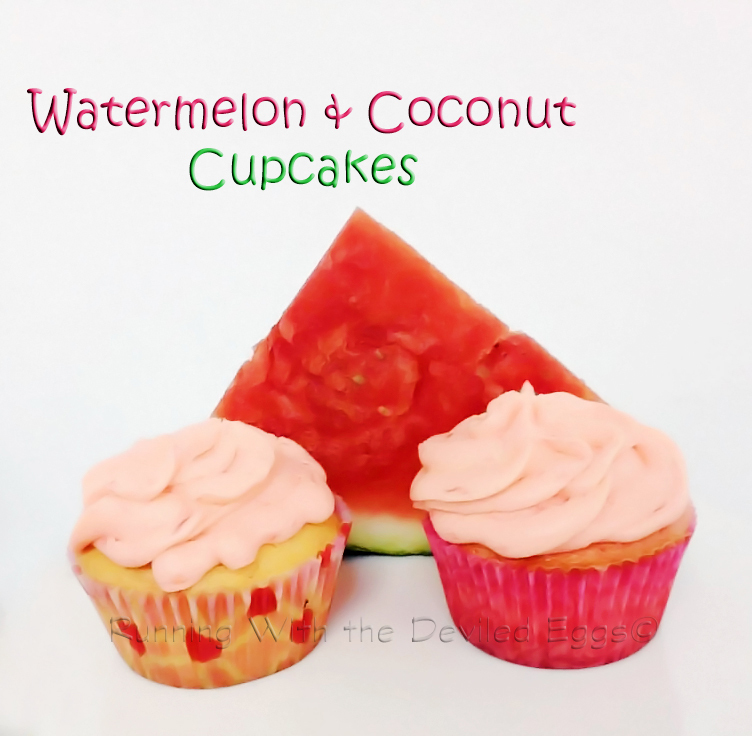 Running With the Devil(ed)....Eggs That Is: Watermelon & Coconut Cupcakes - Kid Approved! I received a watermelon in the mail! In a big box! 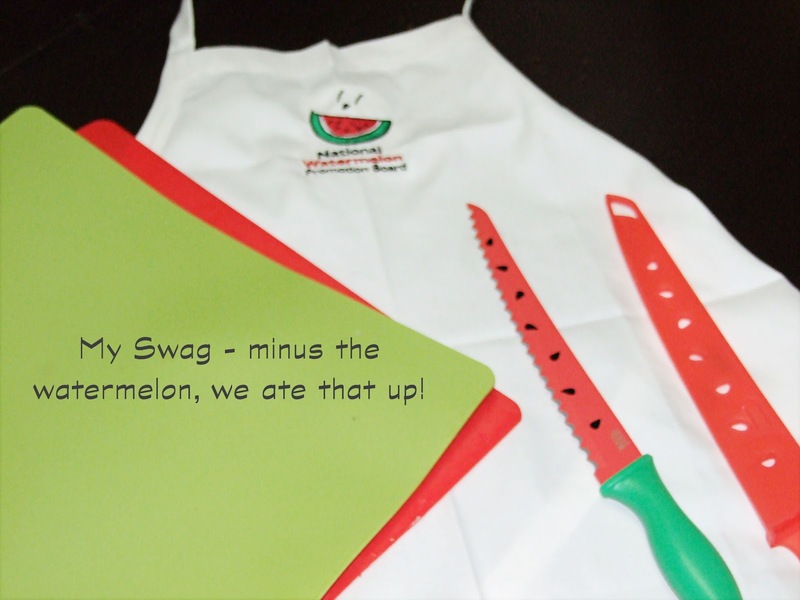 That's not all I received...a few aprons, a couple of new cutting boards and this awesome watermelon knife was also part of the package sent by the National Watermelon Promotion Board in search of some kid friendly original watermelon recipes and carvings. This request sparked some creative juices flowing (and some watermelon juices running down my chin too!) and I have happily come up with something any kid would love - a cupcake! 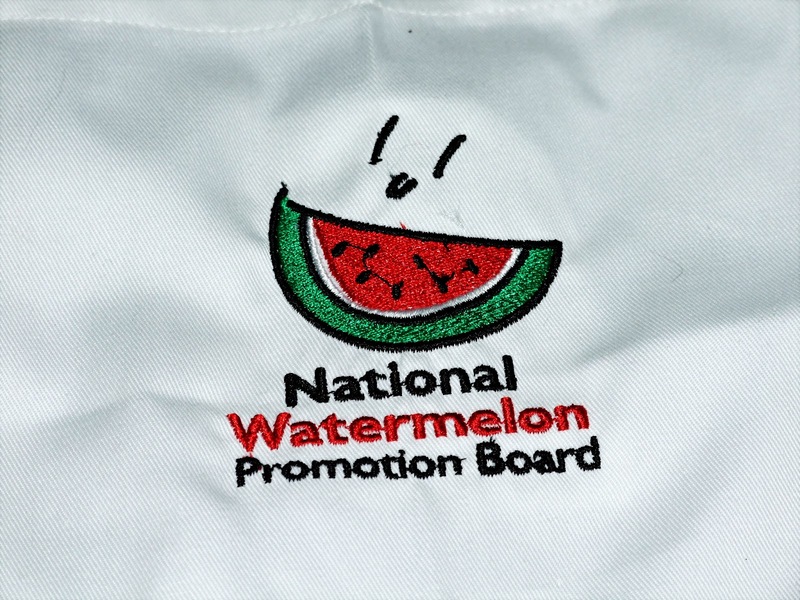 Yes, there are watermelon cupcakes out there in Google land but there aren't any that have a coconut filling! This screams beach, refreshing, summer! This recipe needed to be kid friendly but also mom/dad friendly. Normally I would make my cupcakes from scratch but not everyone has time for that so I did the next best thing - I enhanced a store bought mix using ingredients you already have in your house. Start by cutting up your watermelon and extracting the liquids. You will only need about a quarter of the melon. Removing the rind, cut the fruit into chunks, add to a food processor or blender. Blend about 1 minute. Take a bowl with a fine mesh sieve on top and drain the juice. You may need to use the back of a spoon to get more of the liquid out and you should have watermelon pulp left over - don't throw that out!! Set this aside. Get your cupcake batter working. In a bowl, add the box cake mix, along with the ingredients listed (don't use the recipe on the box) and mix until combined. Fill lined cupcake trays about 3/4 of the way full. Bake at 350F for about 22 minutes or until the tops spring back when touched. a few drops of red/pink food coloring if you'd like or garnish with sweetened coconut flakes. In a bowl combine all of the ingredients and beat on high until a smooth consistency. If you like your frosting to be thicker do not use the whole 4 tbsp. of milk. If it becomes too liquidy add more icing sugar. Enjoy making these with the kids or for adults! 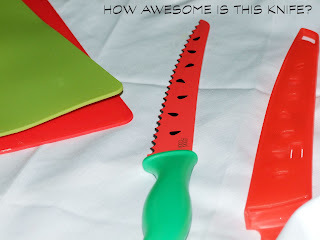 You REALLY need to pick up one of these super cute watermelon knives, it makes cutting them a sinch too! Yum! They look so good :) I never would have thought of an actual watermelon flavoured cake... yummo.